I love how science is chipping away at our species-centric sense of superiority. This time it is the Science News report, He’s no rat, he’s my brother. This bit of research speaks for itself, so I won’t bore you or myself with reiterating the obvious. Of course, I can’t leave without saying how confounding it is that humanity is so driven to elevate itself as the “superior species” capable of love, empathy, awareness, spirituality, and ___( you name it). We are certainly different in many ways from other species, but only superficially….not fundamentally. A symptom’s point of view tells me that it is our insecurity and sense of disconnection that drives us to puff-up ourselves as much as we do. As chapter 2 hints, It is because it lays claim to no merit that its merit never deserts it. Being thinking animals, we puff-up ourselves cognitively while gorillas with their physical prowess puff-up themselve by thumping their chest. Isn’t it marvelous how similar things really are! Calling someone a rat should no longer be considered an insult. The often-maligned rodents go out of their way to liberate a trapped friend, a gregarious display that’s driven by empathy, researchers conclude in the Dec. 9 Science. Initially, the free rat would circle the cage, digging and biting at it. After about seven days of encountering its trapped friend, the roaming rat learned how to open the cage and liberate the trapped rat. “It’s very obvious that it is intentional,” Bartal says. “They walk right up to the door and open the door.” The liberation is followed by a frenzy of excited running. 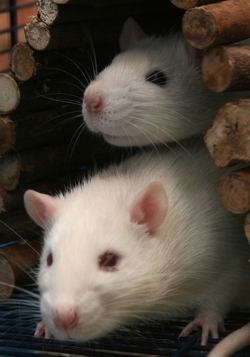 To push the limits of the rats’ goodwill, Bartal and her team pitted a trapped rat against trapped chocolate, forcing a rat to choose which one to release. “These rats adore their chocolate,” she says. The results astonished Bartal: The rats were equally likely to free a rat in distress as they were to free the sweets. To a rat, a fellow rodent’s freedom was just as sweet as five chocolate chips.